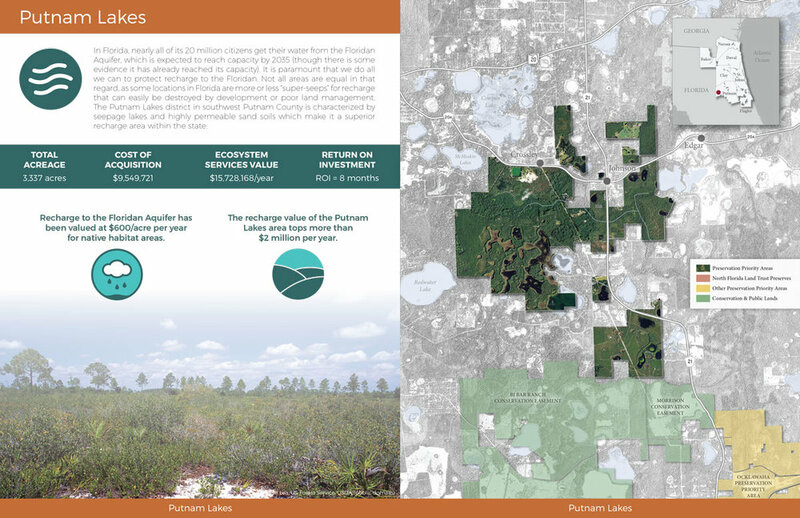 For the North Florida Land Trust, UPGIS created a Preservation Portfolio that features the land preservation efforts of the trust across a 7-county area in northern Florida. The booklet focuses on a cost-benefit analysis of investments made in conservation efforts in 15 focus areas. The ecosystem service values ranged from increased food production value on agricultural lands; recreation revenue generated from conserved lands; carbon sequestration values; aquifer recharge; affects that open space has on adjacent home values; mitigating nitrogen pollution; storm surge buffering; and preserving cypress forests for more productive fish nurseries. UPGIS also created wayside signage for the Big Talbot Island Preserve.